The 2019 version tells the love story of a doctor named Xu Xian and the ancient snake spirit Bai Suzhen. She mistakenly assumes that Xu Xian is a conman pretending to be a doctor. In order to expose Xu Xian as a fraud, Bai Suzhen challenges him to a contest of skill in the medical arts. Through the course of the contest, Bai Suzhen discovers that their patient is afflicted with the venom of the green snake spirit, Xiao Qing. After the incident is resolved, Bai Suzhen and Xiao Qing become like sisters. Fa Hai is sent to the city to investigate reports of missing children. Af first, he thinks Bai Suzhen and Xiao Qing are the ones responsible but becomes their ally later on as they join forces to fight many villains. However, Fa Hai has a premonition of a flood in Jinshan and grows increasingly suspicious of Bai Suzhen. **Note : Maggie Chen and Cecilia Yip, both of whom were in the 1992 version of Legend Of White Snake, also make a guest appearance. There are a few reasons to be excited about this. For one, Alan Yu finally takes the lead! He's been a supporting character in every costume drama that he's starred in that it'll be nice to see him stepping into leading roles for a change. He also reunites with Ju Jing Yi (Legend of Yun Xi) who played his love interest in Xuan Yuan Sword: Legend of the Han Clouds2017. They really didn't get enough screentime then (you'll know why when you watch it), so it'll be cute to see their couple pairing getting another chance. As this remake is looking very much like an idol drama, there's bound to be skeptics who are worried about another childhood favorite headed for ruin. 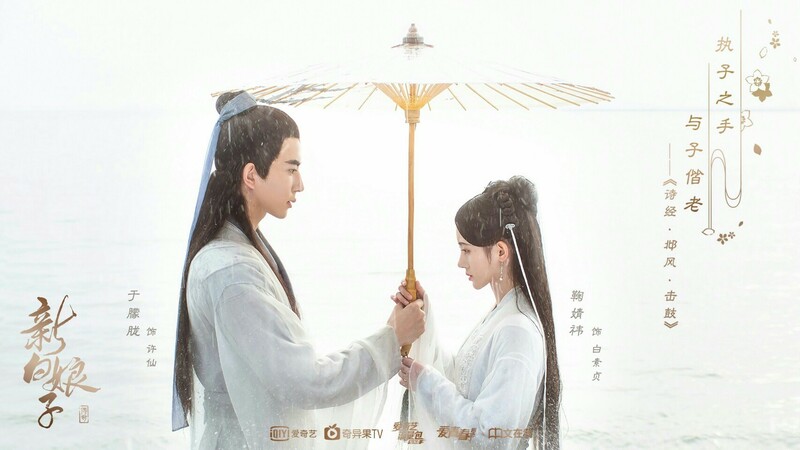 After watching Ju Jingyi in Legend of Yunxi, I'm quite optimistic if not downright excited for this especially since she reunites with Alan Yu Menglong from Xuan Yuan Sword: Legend of the Han Clouds. Also in the cast are Xiao Yan (The Legends) and Pei Zitian (The Taoism Grandmaster). Alan Yu finished filming his scenes back in June while Ju Jingyi just wrapped in the past couple days. It seems like the leading ladies are almost always the last ones standing though I supposed it makes sense with Ju Jingyi playing the titular white snake. I love the old drama!!! I really hope this will do great too. And I like her from Legebd of yunxi, as I'm watching it now. Hopefully this come out and sub it. I tried to watch the one with Yang Zi and then I learned it didn't give an appropriate happy ending, so I just dropped it. Is this another tragedy version? Can't wait for this because of JJY. I adore her in Legend of Yunxi so eagerly waiting for this one. She looks absolutely beautiful in historical dramas. Though, I am just not big on remakes but will watch this for her. Usually i avoid to watch all familiar stories (especially, i still can't move on from 1993 version), but for Ju Jingyi and Alan Yu, i'm gonna watch it. This is another adaptation of The Legend of Madame White Snake? I hope that the plot will not deviate from the original classic too much. This is not the first time that Alan Yu and Ju Jingyi will act as an on-screen couple. Ju Jingyi previously made an appearance as Alan Yu's love interest in the 2017 drama Xuan Yuan Sword: Legend of the Han Clouds. Legend of White Snake is adapted from a classic Chinese folktale about a love story between a human and a white snake spirit cultivating to be an immortal. ^Im super excited for this!!! !2019 Hurry up!!! He is cute!! And she is pretty!!!!!!!!!! There is a trailer! The visuals look nice. The CG doesn't look too jarring from this trailer. I LOVE how they incorporated the original theme song. Anyone know when the release date is? ^The trailer looks good!!! I can already see the leads have chemistry :)!! !